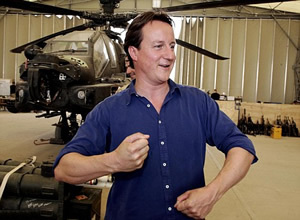 NGOs have responded to David Cameron's plans to "join up" the International Development and Defence budgets with dismay. Left Foot Forward reported this morning on David Cameron’s speech outlining plans to “join up” the international development and defence budgets as part of his party’s National Security Strategy; we have contacted NGOs for their reaction to the speech. “David Cameron’s headline pledge to meet the UK’s aid promises remains welcome but the small print revealed today is of real concern. “We welcome David Cameron’s commitment to ring-fence the UK international development budget. However there is an urgent need for the Conservatives to clarify that the purpose of development aid is poverty reduction, not subsidising military operations. “Save the Children is very concerned that the Conservatives’ security spokesperson, on BBC Radio 4’s Today programme this morning, left open the possibility of significant aid funds being diverted into stabilisation units. “Cameron can expect a fight from NGOs if he tries to push all the government’s development efforts into mopping up after costly wars. He promised to maintain a 0.7 per cent share of gross national income for development spending. More analysis to follow on Monday. Isn’t the problem that he’s trying to address that the MoD and DfID don’t really work very well together? This is something Lord Ashdown wrote about in his big essay on Afghanistan a year or so ago; he said that our efforts in Afghanistan but also in Bosnia are hampered and have been hampered by mutual distrust between the MoD and the DfID. I believe Ashdown suggested far more integration of the two departments and praised USAid which works very closely with the military in situations such as Afghanistan, but also Haiti. The NGOs are right in that the development work which is far more long-term doesn’t really have a military angle. However in emergencies such as Haiti when hospital ships are sent and aid is distributed through a Brazilian military peacekeeping force an integration of military response and humanitarian aid makes a lot of sense? Similarly in Afghanistan which is a conflict with a number of development goals tied in. It seems like common sense to ‘join up’ implementation, if not funding. Very often we use the military to deliver humanitarian aid, and increasingly we need development aid to follow the military in conflict zones. If the two ministries continue to distrust each other then that’s very damaging to both our development and defence policy. Though, joining up the budget’s ridiculous. Depends what he’s talking about really. Sierra Leone and Libera looked like very good uses of the military forces to do developmental good. Perhaps you don’t agree? @ Tim, yes I think it can work in the right circumstances, and DfID are already working together with the MoD in Afghanistan through the Stabilisation Unit. The key question here is about diluting the aid budget for MoD operations, any money for military purposes should be additional.